Major announcement: Two new imprints! Today is our official two-year anniversary. Over the last two years, Snowy Wings Publishing has grown and evolved into something so much bigger and better than we ever could have imagined back in 2016 when we first started brainstorming this crazy idea. Now that we’ve been in the game for a while, we’ve been able to take a step back and look at where we’re at and where we’d like to go. When SWP first started out, we were a publisher of YA and NA fiction, and we anticipated that our audience was going to skew older, attracting adult readers of YA who also enjoyed NA. However, as time passed, we found more and more that our readers were skewing younger than we’d expected, and that our core audience is primarily interested in kidlit. Which is awesome! Fans of kidlit are the hardest to find when you’re an indie publisher, so it’s fantastic that we’ve managed to reach those readers. When we added MG as a SWP genre, we weren’t sure what the reception was going to be—and we were surprised and delighted by how much interest there’s been in our MG titles. We’re so excited to be announcing new MG authors and books over the coming months, and we think you’re going to love them. However, stepping back and assessing the state of SWP, we noticed that this interest in kidlit has come at the expense of our NA titles, particularly the ones that are more adult than our “Upper YA” titles (which feature characters between the ages of 18 and 21 but otherwise are very YA in tone and content). That’s why, after careful consideration and discussion amongst our authors, we’ve made the decision to open not one, but two new sister imprints that focus entirely on NA and adult fiction! 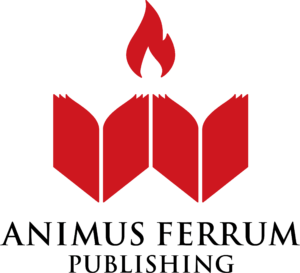 Both Animus Ferrum and Caleo will be launching in January 2019! If you’re interested in either of these genres, we’d love to invite you to join our readers’ groups on Facebook—you can find Animus Ferrum’s here and Caleo’s here. Additionally, these imprints will be publishing new books by current SWP authors, as well as bringing new authors into the fold! Look for announcements about our launch titles and author lineup at both imprints in the coming months. Moving forward, Snowy Wings Publishing will be focusing on publishing great books for teens, be it Middle Grade or Young Adult (including Upper YA titles in the vein of the Curse of the Phoenix series, Orbit, and A Love for the Pages). We’ve got several fantastic new authors and books that we’ll be announcing over the next several weeks, and we can’t wait for you to meet them! Thank you so much for making SWP’s first two years such a rousing success. We’re looking forward to bringing you many new books for years to come, both here and on our two new imprints!